I am actually surprised that Jonathan is allowing me to blog this one as he is a self proclaimed aficionado of all thing cake…errr desserts really! Don’t get me wrong, he loves photography, he loves wedding but he is IN love with cake! And man oh man did we have some fabulous cakes this year! So much diversity too! Below are some of our favorite cakes and well desserts we photographed (and ate) from our 2011 weddings. Huge thank you to all the cake designers who created these delicious works of art! Raetzsch Wedding ~ Cake by Romano’s Bakery ~ The bride had mini 2 layer cakes made for each table which served as their centerpiece and dessert! Brilliant! Thomas Wedding ~ Cake by Creme de la Creme ~ this groom’s cake was fashioned around this couple’s love for hunting. Great job huh! Tower Wedding ~ Cake by Creme de la Creme ~ I think this elegant wedding cake and its floral cake base wins as the most beautiful cake of 2011! Absolutely gorgeous wedding cake! 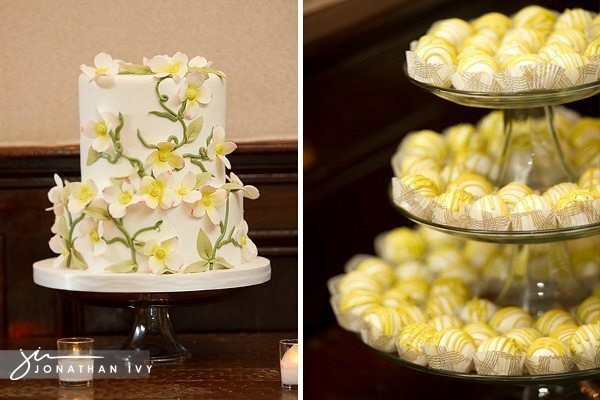 Valderas Wedding ~ Cake balls by Sugar Bee Sweets & Cupcakes by Opulent Cakes. Sugar Bee’s cake balls ARE THE BEST!!! And I end this post with the most meaningful cake of all….Emma’s baby shower cake by Susie’s cakes! This is not only the most delicious cake I have ever had, it is also the cutest! The belt & topper both designs from Jacqueline Chapelle.